Poor water quality, chemicals and effluent water can all be tough on sprinklers, causing wear and tear, and shortening their working life. That’s why Senninger recently introduced the i-Wob2, the wobbler that’s designed to last even longer in the field. The i-Wob2 features a protective shroud, which guards the sprinkler’s improved wear surface from the splashing of adjacent sprinklers, grit and direct UV damage. Senninger Marketing Director Diann Ilkenhons says another benefit of the i-Wob2 is the integration of a dual nozzle carrier feature on the shroud. The i-Wob2 also comes with a three-year warranty on materials, workmanship and performance. That’s the longest pivot sprinkler warranty in the industry. Ilkenhons says Senninger will continue to produce the i-Wob UP3, as well, so growers can choose the best sprinklers for them. Senninger introduced Wobbler technology in 1978. Using grooved deflectors to divide a flow into numerous streams of water keeps them in a constant wobbling motion to further divide each stream into consistently sized droplets. The consistent droplet size is what helps maintain a sprinkler’s pattern integrity against wind drift and evaporation. This technology soon became an industry standard. 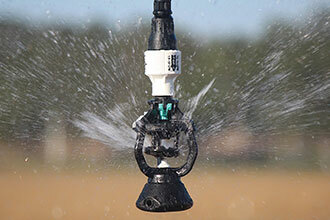 The i-Wob was introduced in 1997 and is the most imitated sprinkler in irrigation. Ilkenhons says that’s because others recognize the uniformity and low application intensity benefits of Wobbler technology.